Amsterdam has a number of international coach (bus) services which can take you around Europe. In this article we will take a detailed look at 3 coach companies operating from Amsterdam and the Netherlands – Flixbus, Ouibus and Eurolines. Flixbus is a long-distance international bus company from Germany. It operates coach services from Amsterdam and other Dutch cities to both Germany and European destinations. Flixbus operates regular services between Amsterdam and many cities in Germany including Berlin, Cologne, Dresden, Dusseldorf, Emmerich, Frankfurt, Hamburg, Heidelberg, Koblenz, Mainz, Munich and Stuttgart. Flixbus also sells domestic bus tickets for journeys between various Dutch cities from €5. Flixbus uses a fleet of modern buses with comfortable seating (78cm/31″ pitch), power sockets and free WiFi. Drinks and snacks are available for purchase on board. Ticketed passengers are able to bring up to 2 cases with maximum combined weight of 30kg plus one piece of hand luggage (max 7kg). The main Flixbus stop in Amsterdam is just outside Amsterdam Sloterdijk station (at Piarcoplein, 1043 DW Amsterdam). 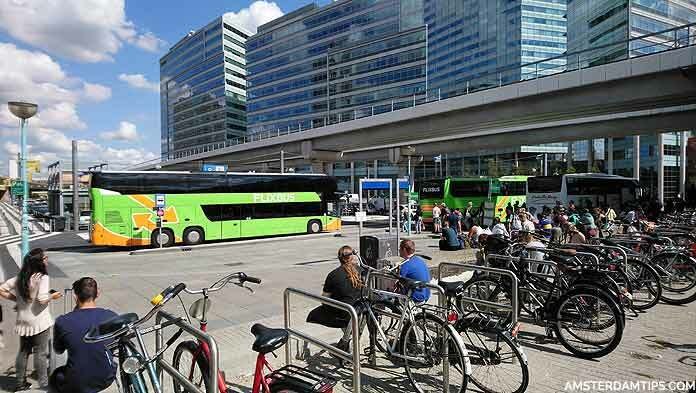 Flixbus also operates from Amsterdam Bijlmer-ArenA station and Amsterdam Schiphol airport. Standard one-way fares start from around €9 though watch for promo fares. OUIBUS (formerly iDBUS) is a European coach (bus) company which offers services from Amsterdam to Lille, Paris, Antwerp, Brussels and London. OUIBUS is owned by SNCF (French Railways) and brands itself as a premium coach service. It also partners with National Express (UK) and ALSA (Spain) on some routes. In Amsterdam the OUIBUS coaches depart/arrive from Amsterdam Sloterdijk Station (Piarcoplein 69, 1043 Amsterdam – the same as Flixbus) in the west of the city. Sloterdijk can be easily reached by train from Amsterdam Central station – the journey takes 5 minutes and the standard OV-chip card fare is €2.30, otherwise it’s €3.30 for a disposable ticket. Or use either GVB metro line 50 or trams 15 and 19, €3 single. Amsterdam-Lille: Runs up to 2x daily with the 300km journey to Lille currently taking either 3 1/2 hours or a slower 5 hours. The cheapest standard tickets start at €15 one-way. Amsterdam-Paris: This runs up to 5x daily with 4 daytime services and 1 night service. The journey duration varies between 6 hours 20 mins and 8 hours 35 mins. Fares start from €19 one-way. Amsterdam-London: OUIBUS operates up to a 2x daily service between Amsterdam and London Victoria – generally one by day and one overnight. Journey time is around 11-13 hours. Fares for Amsterdam-London start at €25 or £22 one-way. Amsterdam-Brussels: Runs up to 4x daily with journey times around the 3 hour mark. Fares for Amsterdam-Brussels start at €11 one-way. Amsterdam-Antwerp: Runs a daily service taking 3 hours 15 minutes, longer than some Brussels services! Fares for Amsterdam-Antwerp start at €9 one-way. Amsterdam-Bruges: Runs a regular service via Utrecht and Antwerp taking 4 hours 25 minutes. Fares for Amsterdam-Antwerp start at €15 one-way. Note that OUIBUS also serves Den Haag, Rotterdam and Utrecht in the Netherlands. OUIBUS also has a number of other bus routes from its Paris hub including many domestic French cities, Genoa/Milan/Turin (Italy) and Girona/Barcelona (Spain). It offers more Spanish cities in conjunction with ALSA. Watch for occasional promotional fares which are cheaper than the standard fares. Tickets can be purchased online (ouibus.com) and printed out at home. Passengers must travel with a valid ID card or passport and should arrive at least 30 minutes before departure. 2 items of hold baggage (max 20kg) is permitted plus 2 pieces of hand-luggage on board. OUIBUS coaches have 48 adjustable seats on board with leather headrests that offer 84cm (33″) seat pitch. Each pair of seats has a power outlet (European) and USB ports, there is free WiFi and TV screens show the geolocation of the bus in real time. Seating is assigned by number and passengers can choose their seat when they book. The buses are wheelchair accessible and there is a toilet on board. Eurolines is a major international coach brand in Europe, part of the TransDev group. The UK’s National Express left Eurolines at the end of 2017. 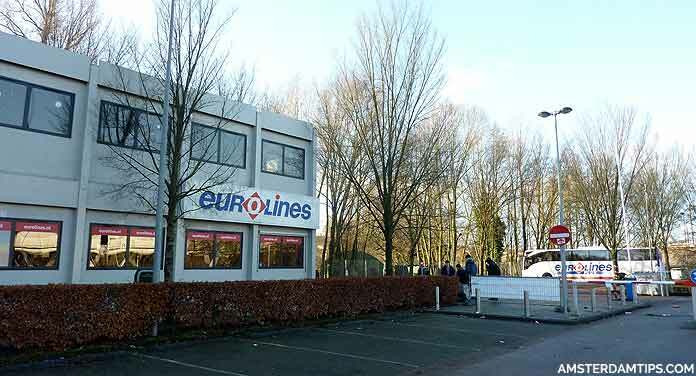 Eurolines coaches in the Netherlands are now effectively run by Eurolines France. This has meant the route network has been cut from previous years and some international services require a change in Paris or elsewhere. In Amsterdam, Eurolines coaches arrive and depart from its terminal next to Duivendrecht station in the south-east of the city. The Eurolines ticket office at Duivendrecht (Stationsplein 3, 1115 BZ Amsterdam) is open daily 0630-2230. Duivendrecht station is a 2-level metro and train station across the car park from the Eurolines terminal. NS train services run to Amsterdam Central and Schiphol airport. GVB metro line 54 can take you north to Amsterdam Amstel and Central or south to Bijlmer-ArenA. Metro line 50 runs north-west to Sloterdijk via RAI, Zuid and Lelylaan. Amsterdam-London Victoria, which operates up to 2x daily (daytime and overnight service) which takes 10-13 hours and is priced from €19/£18 one-way. Amsterdam-Paris, which operates up to 7x daily (daytime and overnight service) which takes 6-8 hours and is priced from €15 one-way. Amsterdam-Antwerp, which operates up to 6x daily (daytime and overnight service) which takes 2-3 hours and is priced from €11 one-way. Amsterdam-Brussels, which operates up to 12x daily (daytime and overnight service) which takes 3-4 hours and is priced from €11 one-way. There are also direct services between Amsterdam and Berlin, Frankfurt and Prague. All buses have reclining seats, free WiFi and an onboard toilet.